Originally created for military pilots, the bomber jacket, also known as the flight jacket, has worked its way up from wartime uniform to wardrobe favourite. Comfortable, cool and effortless, the outwear silhouette has been adopted by casual wear lovers for generations, still holding its own as a fashion staple to this very day. From high-end to high street, the bomber continues to be revived and reinvented season upon season, with little sign of stopping. SS15’s key jacket trend, if you’re thinking of introducing a bomber or two to your outerwear line-up this season, feast your eyes on our recommendations below. As an original outfitter to the US military, Alpha Industries is a seasoned expert when it comes to creating the perfect bomber jacket. With over fifty years’ experience, the brand continues to adapt its tried and tested designs for the modern day, treating us to a new slim-fit version of its iconic MA-1 jacket in an on-trend red colourway for SS15. 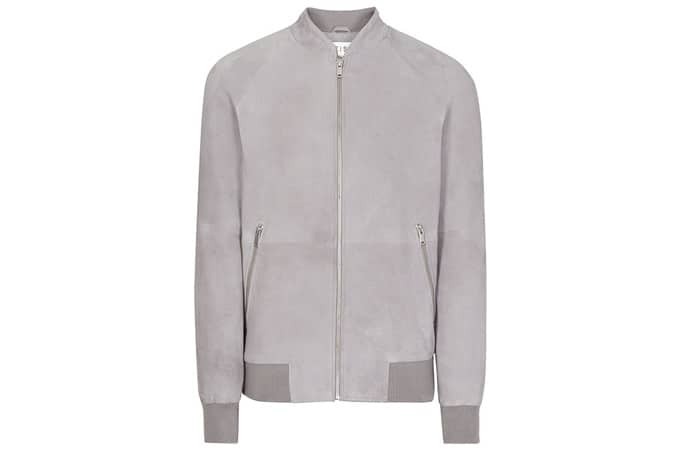 For a cleaner finish, cast your eyes on Reiss’ Toulon bomber jacket in elegant grey suede. Its sleek silhouette and relaxed fit creates a casual-meets-formal look, perfect for smart-casual occasions. Finished with gleaming silver-coloured hardware, this jacket oozes sportswear sophistication. Available at Reiss, priced £375. Soft, lightweight and oh-so-easy to wear, this American Apparel option is crafted from Flex Fleece, ensuring comfort and allowing for freedom of movement. We particularly like the monochrome windowpane check that adorns this piece, making it a effortlessly statement you can throw on at any given moment. Available at American Apparel, priced £68. Giving the timeless military jacket a luxury Parisian overhaul, this satin number by Maison Kitsuné is the perfect blend of classic and contemporary. Constructed in the shape of the MA-1 flight jacket, it has all the markings of its original – military-spec zips and utility pockets – while its nylon-blend shell and slim silhouette provides the high-end finish. Available at END Clothing, priced £415. British label Waven has provided a way to nail two trends in one piece this season, producing the bomber jacket in solid blue denim. This 100 per cent cotton piece feels a little bit retro – think eighties sportswear, without the matching tracksuit bottoms – while its slimline structure carries it into the modern day. Pair with a crisp white shirt for a smart, minimalist finish. Available at waven.co.uk priced £68. 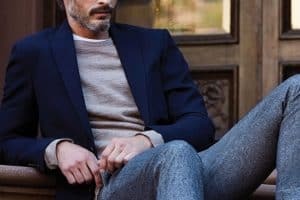 American workwear is the signature of this Alabama-based label, so it’s no surprise that its new bomber jacket has a real robust feel. Crafted from a coated linen and cotton blend fabric with panelled leather sleeves, this Billy Reid piece is a trooper – built to last due to its range of technical, high quality materials. Plus, the simple navy blue and black palette makes it a match with everything selection. Available at Mr Porter, priced £730. This suede iteration from J.Crew has been inspired by the baseball styles of the 1950s. The two contrasting shades call to mind the rich, deep tones of a time gone by, while the slim sleeves and torso add a modern twist. We recommend keeping things casual with this one; simple denim and a plain T-shirt should do the trick. Available at J.Crew, priced £995. Offering a pop of colour without resorting to busy prints, this simple option from Topman is a winner. Its brushed cotton construction has a bit of nineties Britpop about it, while the bold hue is a real eye-catcher that you won’t see everyone wearing. To maximise its effect, combine this lightweight design with neutral, pared-back pieces. If it’s chic simplicity you’re after, this bomber jacket by French label Ami is sure to appeal. Crafted from rich navy wool, complete with contrasting black cuffs and striking silver hardware, it brings together the best in practicality and understated elegance. It’s only a matter of time before this option becomes your new everyday favourite. Available at END Clothing, priced £325. Low in cost, but high in impact, ASOS’ take on the classic bomber is one for the pattern lovers. Boasting a longline silhouette, panelled torso and striking printed mesh bottom, this streetwear-inspired jacket is eye-catching and sophisticated in equal measures. Be sure to keep the rest of your look clean for a seamless finish. Available at ASOS, priced £34.